Personal Details: Brian was the son of Claude Boland Aitken and Margaret Jean (Maggie) Aitken (born Silcock). Brian's parents were from Britain, and he was born in Auckland,New Zealand. He was educated at Whitiora Primary School in hamilton, and then went onto Hamilton Technical College. From there he began an apprenticeship as a motor mechanic at Armstrong Motors, in Hamilton, till joining the RNZAF in 1944. At that time he lived with an aunty, Miss C.G. Silcock, in Hamilton. He returned to Hamilton after leaving the RNZAF and completed his apprenticeship, qualifying as an A Grade mechanic. Brian married Rosemary Weatherhog on the 23rd of April 1949, in Hamilton.They moved to Cambridge in 1952 when Brian purchased a garage business known as McLean and Harrison in Alpha Street. Two years later Brian established B.A. Aitken Motors on the 3rd of December 1954, opening in a new 3000 square foot building he'd had built in Commerce Street, Cambridge. This was a garage that repaired and serviced motor cars, tractors and other vehicles, and was the local agency for Standard, Triumph, Studebaker, Land Rover and Massey-Ferguson. 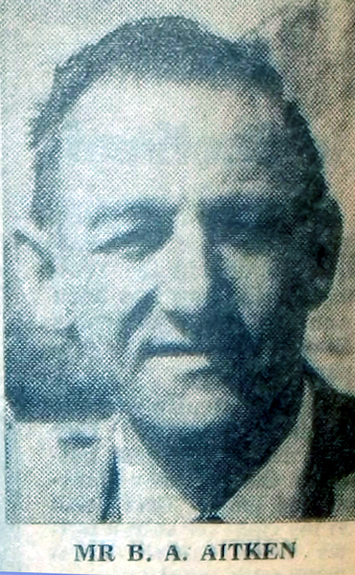 One of the mechanics who had worked for Brian from early 1961 till Brian sold the business was the late Gordon Homewood, father of webmaster Dave Homewood. Gordon and Brian became very good friends in that time. Due to persistent bad health, Brian was forced to sell B.A. Aitken Motors Ltd on the 1st of Februray 1969 to Ernie Gorringe (another Cambridge airman), and Brian's garage became part of the existing E.W. Gorringe Ltd which was at that time a motor garage on the corner of Victoria and Queen Streets, where KFC now stands..Brian however stayed on in the employ of the E.W. Gorringe Ltd, working in the parts department. Brian and Rosemary had four children, Annette (later Todd? ), Marilyn, Michael and David. The various interests that Brian had included motorcycle racing and reliability trials quite successfully when he was younger. He served for six years as the chairman of the Eastern Waikato brnch of the New Zealand Motor Trade Association, and twelve years on the executive of the Waikato branch with a term as president. During this time he was a member of the Dominion Council, and a committee memebr of the garage section. He was also very active in the affairs of the New Zealand Motor Industry in the Waikato, being a foundation member, a Dominion Councillor and a branch president. Brian had a keen interest in education and served for six years as chairman of the Cambridge East School committee; four years on the Waikato Schools Committee's Association; and three years on the Cambridge High School Board of Governors. He'd also served as chairman of the Cambridge Scout Group committee. Another interest saw him serve a term as a vestryman at St Andrew's Anglican Church in Cambridge. Brian was a member of the Air Force Association and also the Cambridge branch of the Homeserviceman's Association, in which he served a term as president. And he was a memebr of the Cambridge Bowling Club. Service Details: Brian spent 18 months in the Air Training Corps before he joined the RNZAF at the age of 18. He started his Air Force career at RNZAF Station Harewood on the 21st of January 1944, joining as an Aircraft Hand (ACH). He trained as a Flight Mechanic at the Technical Training School, RNZAF Station Nelson, and was remustered to the trade of Flight Mechanic. He was then posted to RNZAF Station Whenuapai's Maintenance Wing where he mainly worked on the Douglas Dakotas and Lockheed Lodestars and Hudsons of No. 's 40 and 41 Squadrons. On the 29th of June 1945 he was posted to No. 1 Repair Depot, at RNZAF Station Hamilton. He finished his service at this station, receiving his discharge on the 12th of October 1945. Date of Death: Brian passed away following a long battle with diabetes, on the 23rd of November 1969, aged just 43. Sadly Rosemary Aitken died suddenly on Boxing Day from an asthma attack, 1969, just a month after Brian's death. Just before her death Rosemary had presented a memorial prize in Brian's name to Cambridge High School.